Virtually all forms of payment are accepted, including: cash, check, money order, Visa, MasterCard, American Express, Discover, Bank Debit Cards, and PayPal. 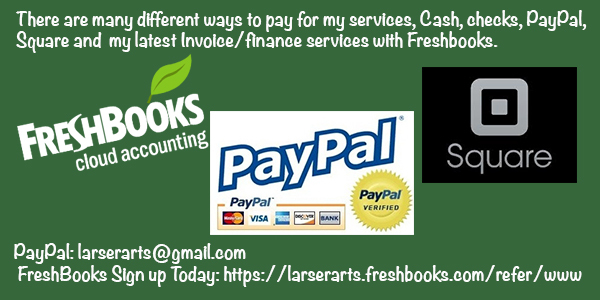 You may arrange a time to call me with VISA, MasterCard, or Discover payments – or can pay online with a credit card via PayPal (no account required). Upon mutual agreement to enter into a contract, I will generally request a non-refundable down payment. If a project has many stages of completion, the contract may also include a few payment markers. Full payment is expected within 30 days of project completion, live event, or teaching session. Request a quote for your next project, event, or art lesson.